Stephanie Brown's second semester at Gotham U. starts like anyone else's: new classes, new allies, a vigilante stalker-everything a gal could want! But what Batgirl isn't prepared for is the arrival of the mysterious Order of the Scythe. Who are they, and why have they set their sights on her? 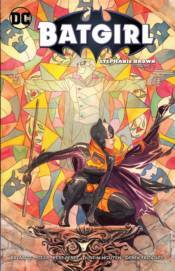 Also features Clayface, Supergirl, Klarion the Witch-Boy, Damian Wayne and more! Collects BATGIRL #13-24, BRUCE WAYNE: THE LONG ROAD HOME: BATGIRL#1 and a story from BATMAN INCORPORATED: LEVIATHAN STRIKES #1.